The TicBand is Mobvoi’s least expensive wearable device. 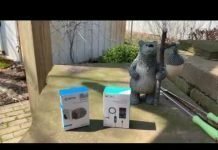 While Mobvoi has heavily promoted their Wear OS smartwatches the Ticwatch E and Ticwatch S and their premium Ticwatch Pro, finding information about the TicBand on their website proved to be difficult, if not futile. I wasn’t successful in finding any information. Instead, I only knew about the TicBand from an advertisement I saw for it in the Mobvoi app but was interested in it because of its price and that it was coming from Mobvoi. The Bottom Line: The TicBand is an affordable fitness tracker with step tracking, 24/7 heart rate monitoring, and good sleep tracking. It’s a good option for those wanting to motivate themselves to take longer walks and monitor their heart rate and sleep on a daily basis. The TicBand has a very familiar design, reminiscent of many bracelet style fitness trackers like the Fitbit Alta or the Garmin Vivosmart. The features are few on the TicBand compared to a smartwatch but for those looking for an inexpensive fitness tracker to count their steps, monitor their heart rate 24/7, and have sleep tracking, it might be a good choice. The only timed activity the TicBand supports is running and I compared it against the Apple Watch Series 4 on the treadmill and the results are below. Built-in or connected GPS isn’t available with the TicBand. Instead it will estimate your total daily distance based upon the number of steps taken and I’m assuming your stride length. 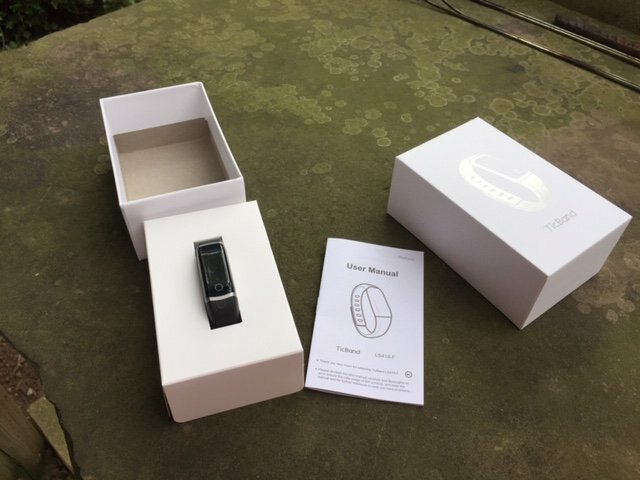 Operating the watch is very simple as the menu contains only 7 items: the clockface, number of steps, current heart rate, distance, running activity, battery indicator, and estimated calories burned from your daily steps. A touch sensitive area is located at the bottom of the screen which is used to switch between different menu items. A nice feature of the watch is that the option to display text vertically or horizontally is available. Also, the TicBand’s display can be set for right or left-handed users. Notifications are simple. You’ll see who is calling you or has sent a text message. The entire text message isn’t shown but you’ll see a preview. 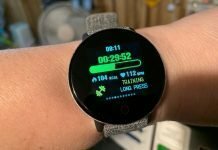 Since the main reason one would choose a tracker like the TicBand is step tracking, I tested it out for several days and compared the results against the Apple Watch Series 4, since I’m also testing it out too. 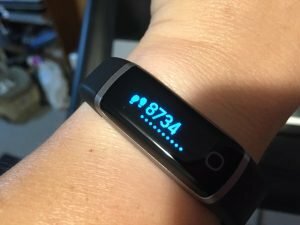 The TicBand is similar to many budget fitness trackers I’ve reviewed in that it will not count steps from short walks. For example, if you only take about 20 steps or so, it probably won’t count them. So, if your day consists of a lot of short walks, it’s going to miss many of those steps. This is done to prevent the tracker from counting arm movements as steps. It wants to make sure you’re really walking. In contrast, the Apple Watch will try to count every step. You don’t have to reach a number of steps before it begins counting them. This is true of Garmin and Samsung watches I’ve reviewed. The Fitbit Versa was a little stingy on the steps too but not like the TicBand for those shorter walks. However, the TicBand performed well for longer walks. Below are the results of three 200-step walks I did compared against the Apple Watch. There wasn’t a huge difference between the two in these tests, so for longer walks I got similar results. For a much longer 46-minute test on a treadmill the TicBand estimated 5,529 steps while the Apple Watch Series 4 estimated 5,487 for a difference of only 42 steps. That’s pretty darn close for such a long walk/run! Note: I should say that I didn’t compare the TicBand to the Apple Watch because the Apple Watch is assumed to be 100% accurate. It’s not, and not fitness tracker is, but I like comparing high-end fitness trackers to more affordable ones to see what the differences are. I think it’s helpful information for consumers to know. Of course, the Apple Watch does way more than the TicBand but I’m only comparing basic fitness features here. While the TicBand did well with step tracking during longer walks, I have to take some major points off for missing a number of steps throughout the day. As was stated earlier, the TicBand doesn’t utilize GPS to estimate distance while the Apple Watch does for outdoor activities. Below are the results from a 22-minute outdoor walk including steps, average heart rate, calories, and distance estimates. 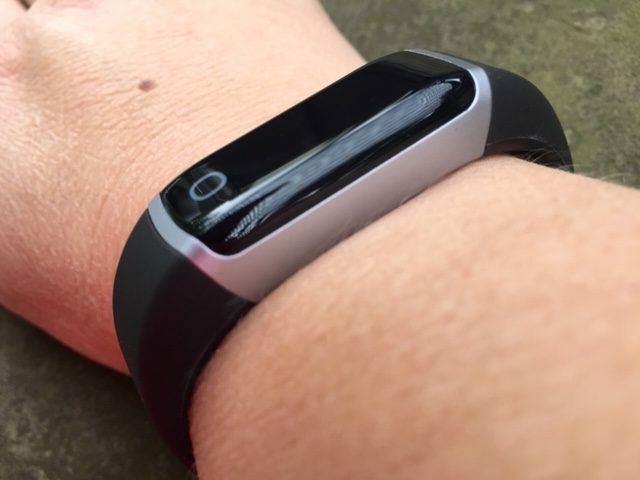 In this test, the TicBand estimated quite a few more steps than the Apple Watch. It’s hard to say which one was more accurate but looking at the distance estimate, it looks like the TicBand might have over-counted the steps but it’s hard to say. There’s a tenth of a mile difference in the estimated distance but considering the TicBand doesn’t have GPS, that really isn’t bad. Average heart rate and calories were both very close between the two. 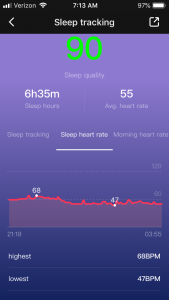 The TicBand seems to have done a very good job monitoring my resting heart rate throughout the day and during sleep. The results were what I would expect and very close to the information the Apple Watch was giving me. 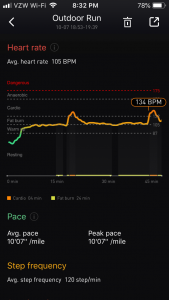 As a 24/7 heart rate monitor the TicBand performed well. 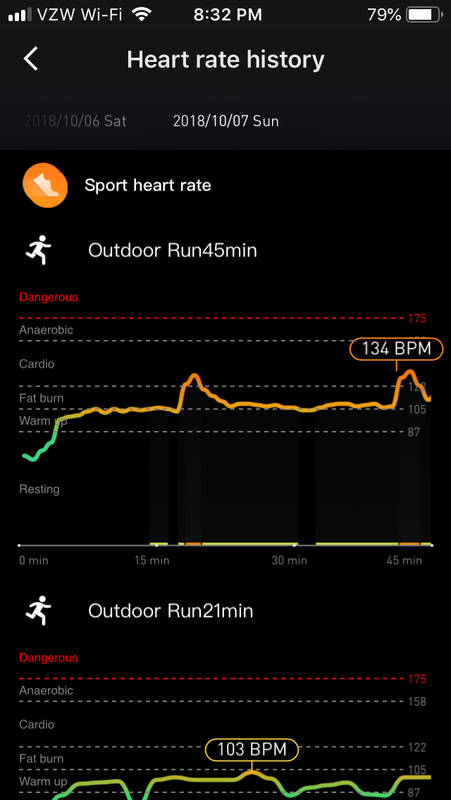 During timed running activities it usually did a good job compared against the Apple Watch. 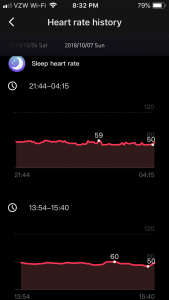 Also, I didn’t notice prolonged erratic drops or spikes as it monitored my heart rate during timed activities. 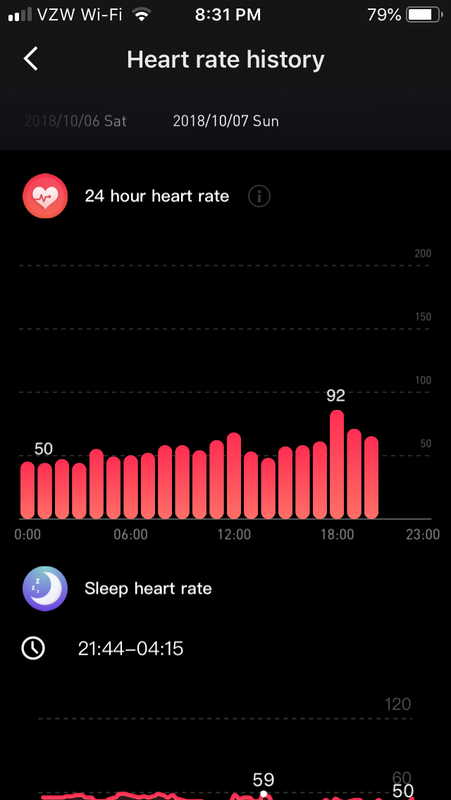 Once in a while it did seem to underestimate my heart rate for short periods of time but bounce back to what the Apple Watch was telling me. 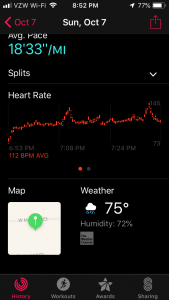 Below are the results from a 46-minute treadmill walk/run with screen shots from the Mobvoi app compared against the results of the Apple Watch. Overall, the TicBand performed okay for a budget-friendly fitness tracker compared against probably one of the best smartwatch/fitness trackers available in 2018. 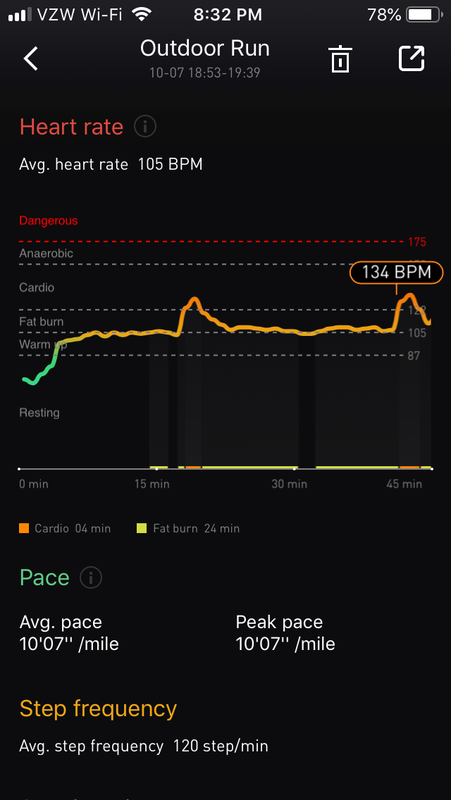 I did notice that the TicBand seemed to underestimate my heart rate by about 6-7 bpm here and there and that is reflected in the data above. 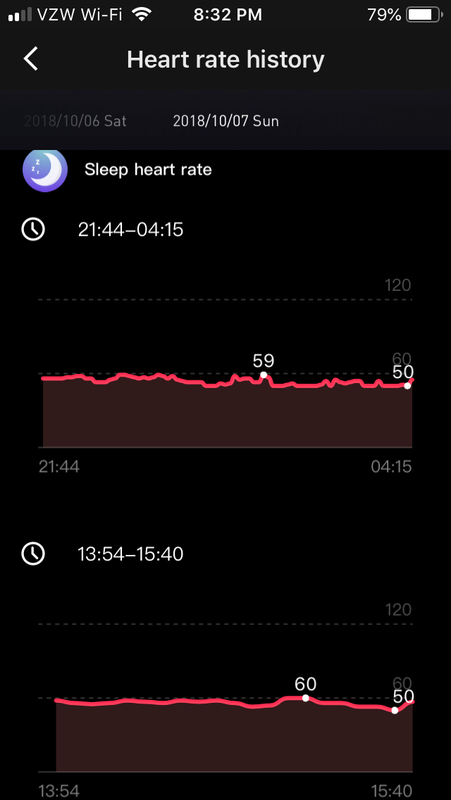 Also, there’s quite a bit of difference in the peak heart rate. Still, the heart rate sensor of the TicBand performed better than most fitness trackers I’ve tested in this price range. 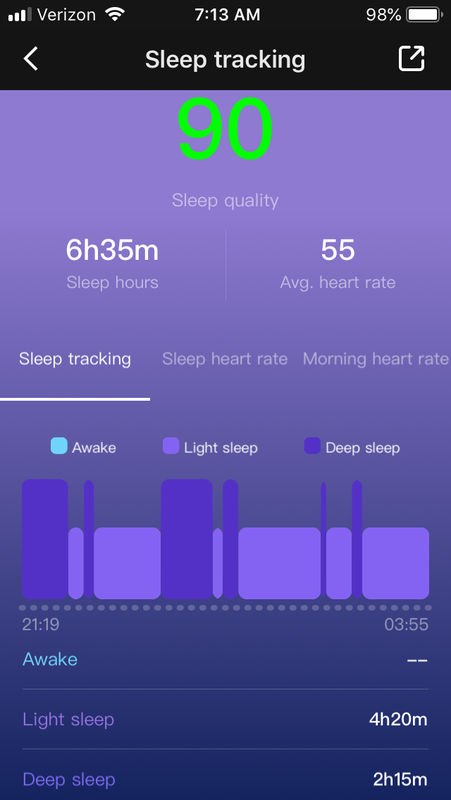 I could compare the sleep tracking against the Apple Watch because the Apple Watch doesn’t support sleep tracking, unless you use third-party apps. However, I had a pretty good idea when I fell asleep and a very good idea when I woke up for the tests that I did. The TicBand did a good job with tracking my sleep. It shows both light and deep sleep and was able to detect when I took a nap on a Sunday afternoon. 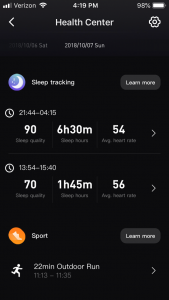 Some of the cheaper fitness trackers aren’t able to detect sleep except during certain times of the day but the TicBand appears to be able to detect sleep, even if you sleep more than once in a 24-hour period. So, if you have a night job and sleep during the day, it will be able to detect your sleep. 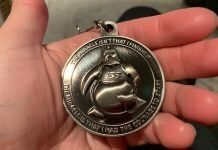 Not all fitness trackers can do this. 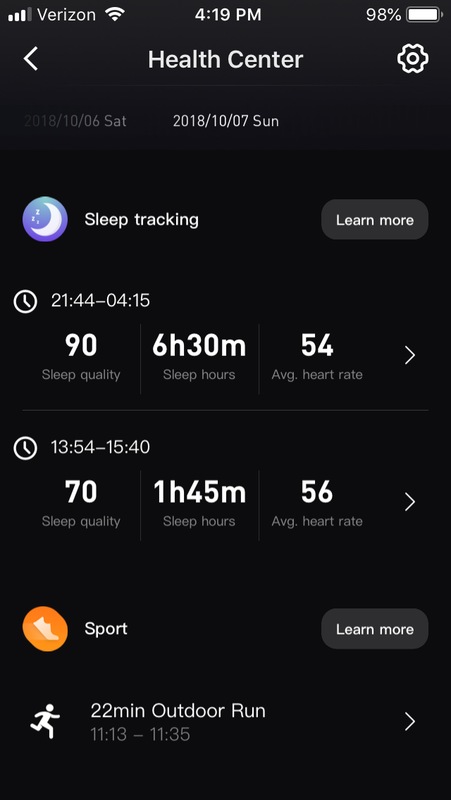 So, overall I was happy with the results of the ability of the TicBand to monitor sleep. 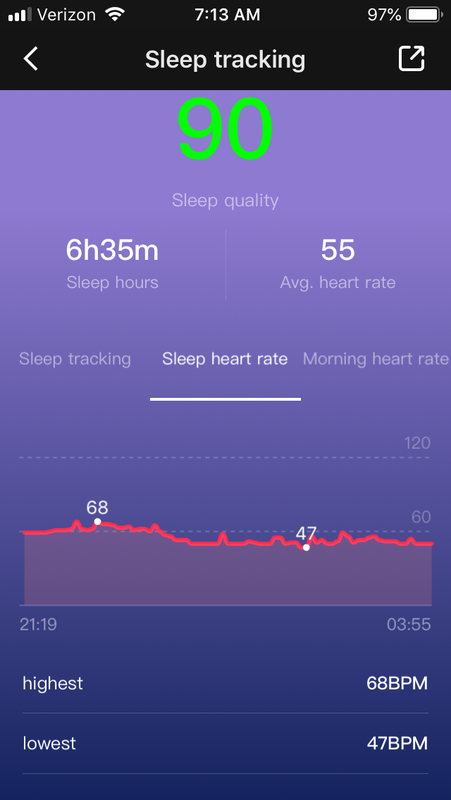 I also like that it shows a graph for heart rate during sleep too. 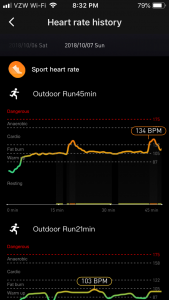 In fact, the TicBand through the Mobvoi app will show your heart rate averages for different times of the day. The TicBand is comfortable to wear and the straps are replaceable. There are push button tabs that need to be pressed in before removing the straps and the click back into place securely. The screen can be difficult to read in bright sunlight but I didn’t have trouble viewing it. The screen also has tilt-to-wake which means that when you turn your wrist towards you the screen will light up. This can be turned off for night time when you (or your significant other) may not want the screen to light up every time you toss and turn and bed. Battery life is advertised to be 5 days and I think that is true. This a tracker you’ll probably only need to charge once a week. It doesn’t have a cord for a charger but instead has a built-in USB end that can be plugged into a USB port on a computer or charging dock. A good thing about this is that you don’t have to worry about bring charging cables with you on trips or losing a charging cable. A con is that the strap has to be removed and you’ll need to purchase or already have a USB charger. The TicBand is a basic fitness tracker for an affordable price that performs well in most areas. I would like to see step tracking improved for those shorter walks. The heart rate sensor performed well in most of my tests and is probably one of the best heart rate sensors in its price range. Distance and calorie estimates were pretty good for a tracker without GPS. The calorie estimates were actually very good in comparison to the Apple Watch. 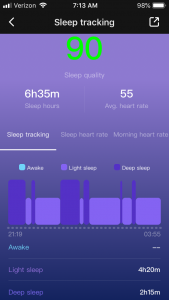 Sleep tracking is something the TicBand appears to do well and better than any other fitness tracker I’ve tested in its price range. The mobile app for the TicBand is the same app that the Ticwatch E, Ticwatch S, and Ticwatch pro uses so updates and improvements should be expected. This isn’t an app that’s going to be abandoned and never updated. That’s an advantage to purchasing a budget-friendly fitness tracker from a company that has other popular products. The TicBand is an affordable fitness tracker with step tracking, 24/7 heart rate monitoring, and good sleep tracking. It's a good option for those wanting to motivate themselves to take longer walks and monitor their heart rate and sleep on a daily basis.